Captain Marvel: The Power of SHAZAM! 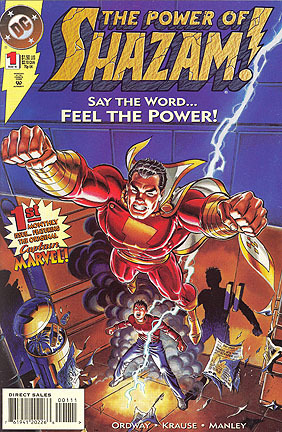 Captain Marvel "The Power of SHAZAM!" 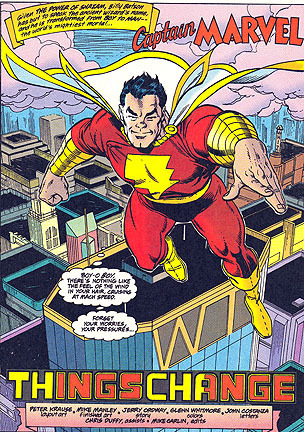 Origin: After young Billy Batson's archaeologist parents are killed by Theo Adam, A mysterious stranger leads the young orphan newsboy to the old Wizard Shazam, who grants him the power to change his body into that of Captain Marvel. He later discovers that his sister, Mary, has the same power, and later gives a share of his power to Freddy Freeman. 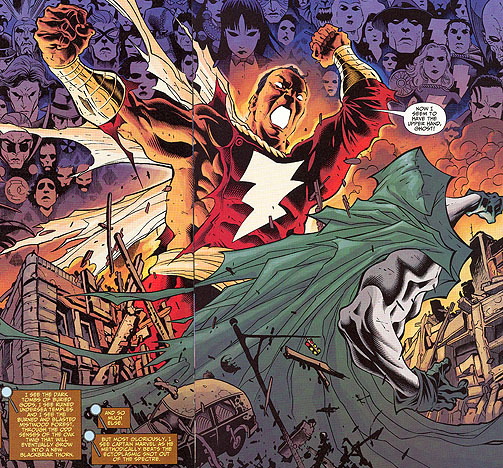 This series was notably loaded with references and tributes to the original Fawcett comics of Captain Marvel and their other superheroes. Trends in history and culture: Boom and bust of comic books in the 1990's, post-modern heroes, retro styles, abandonned children, gender roles, Celtic mythology.